What is the status of Mazda's ties with Ford? "With the change in the ownership level of Ford, we both agreed it would not change the relationship between the two companies." 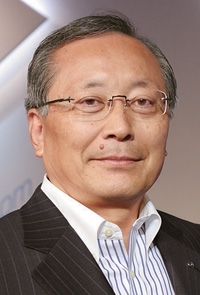 Takashi Yamanouchi took over as CEO of Mazda Motor Corp. a year ago this month and was immediately confronted by some of the biggest challenges in Mazda's history. U.S. sales plunged. Ford Motor Co. slashed its 33 percent stake in the Japanese company to 13 percent, relinquishing its controlling share. It hasn't gotten easier. By the end of October, Mazda's U.S. market share languished at 2.0 percent, flat compared with a year earlier. And the carmaker is projecting net and operating losses for this fiscal year. Recognizing its lack of hybrid drivetrains, Mazda unveiled a new line of gasoline engines called Sky-G that boost fuel economy through direct injection. The company also is now pursuing its r&d priorities independently of Ford and plans to put its own gasoline-electric hybrid vehicle in showrooms in the 2010s. Speaking through an interpreter, Yamanouchi, 64, talked with Editor Jason Stein and Asia Editor Hans Greimel about the changing relationship with Ford, future products and new technology. Mazda has good products in North America, new dealer facilities and good leadership. But you seem stuck at 350,000 units a year. Why is it difficult to break through that? We'd like them to sell more. That's what I'm asking the people over there. Of course, there's probably a certain limit to our sales capability. But what we don't want to do is break through that limit by resorting to a huge amount of incentives. If you look at the data, you'll see that Mazda has been reducing variable marketing under the current economic situation. Huge incentives hurt dealer profitability and, above all, hurt the trust and confidence of the customers. So we just have to persevere and stand fast during this period. We have to ensure that dealers can maintain their profitability and strengthen their trust in Mazda. I'm confident that if that is the case, sales volume will follow in the future. We just need a little more time. How difficult will it be for Mazda to meet the new U.S. regulations for improving fuel efficiency by the 2016 model year? We have various technologies we can use to cope with such requirements. There are very few companies that have officially declared that they are able to meet CAFE because it carries some political implications as well. All the automakers, including Mazda, are making efforts to comply with those regulations, whether they announce it or not. Can you meet CAFE with your own technology, or do you need cooperation with Ford? Of course, when we can work with Ford, we will. We have various study exchanges with Ford. Just in September, we had a meeting with Ford to exchange technical information. We have a 30-year relationship with Ford, and many of our senior managers are on a friend-to-friend basis. We see value in the two companies continuing to exchange technology and technical information. Your r&d chief says joint development work is following independent paths in the wake of Ford's reduced stake in Mazda. How is that working out? Mazda's Sky technology, or the Sky engine, uses direct fuel injection to meet environmental requirements. But Ford is going for EcoBoost, which is a downsized turbocharger approach. We can't do both so each company is doing its own thing. But in the future, if we continue having this exchange, we assume that there is the possibility we may exchange or use each other's technology. So later on, you may adopt Ford's EcoBoost and combine it with your Sky technology? Yes, if we see the need for that. But that's not clear at this point. There are many things that we can do on our own and many things that we can do jointly. But the relationship of trust is one thing that won't change. In terms of hybrids and meeting CAFE requirements, is there room for Mazda to branch into new vehicle segments in the United States? Mazda has said it wants a hybrid vehicle in its lineup in the first half of the 2010s. What are you working on? I have to say eventually there will be one. We are already working on electric powertrain development, and we have our engineers assigned to a new organization to start research and development on such powertrains. Do hybrid drivetrains make better sense in small cars or big cars? Our biggest car is in the C-D segment, and we have no intention of going into larger segments. Our hybrid, hopefully, will be able to cover C- and D-class vehicles, but not the B class. For small vehicles, we are able to achieve fuel economy comparable with hybrids with the technology we already have. To what degree is Mazda cooperating with Ford on hybrid technology? Or, now that you are more independent, are you looking at other partners? Japanese media have reported that you are considering a hybrid alliance with Toyota. We have a continuing exchange with Ford on this matter. But let me tell you, it is not that easy to just import somebody's hybrid technology and put it into your product. Your Sky-G engines range in displacement up to 2.0 liters. What are you going to do for bigger vehicles? We are looking at 1.3- to the 2.0-liter class so that doesn't mean it will be exactly 2.0 liters. It could be 2.5 or 2.2. With an engine of the 2.0-liter class, we'd like to cover all our products. If you can imagine putting hybrid technology on top of a 2.0-liter Sky-G engine, think of the improvement that would provide. It would probably give significantly better performance than the hybrids on the road today. That's because the base of the hybrid system -- the conventional engine -- is totally different. So Sky-G was developed with the goal of one day linking it to a hybrid system? It's the building-block concept. The base will be Sky-G, but we will add on idle-stop, regenerative braking and ultimately hybrid technology. With the collapse of the SUV market in the United States, do you regret rolling out the CX-7 or CX-9? Nobody could have predicted the economic crisis so some of what has happened is inevitable. But I think the bigger plunge in the SUV market was in larger-segment SUVs. The lower end still has some potential -- for example, the Honda CR-V or Toyota RAV4 type of vehicles. The CX-7 is positioned a little above those two. Cash for clunkers basically cleaned out our stock. So in order to replenish it, we are resorting to emergency production, working on Saturdays and doing full overtime. In Japan, that is very rare. We think that in the future, the lower segment of the SUV market still provides hope. Maybe we can put some of the Sky-G powertrain into those products. When the Mazda2 comes to the United States, what kind of sales volume are you expecting? Nothing has been announced, other than the fact we are bringing this car to the United States. There's the Los Angeles motor show in December so I will go there personally to announce the sales plan for this product. But with the yen so high against the dollar, isn't it a bad time to build such a small, low-margin car in Japan and export it to the United States? To counter that problem, Honda may bring production of its Fit compact to North America. Oh, so you think it is low-margin? Maybe our costs are lower than Honda. In any event, we will never do anything that is unprofitable. With all the distressed automakers in the United States and dealerships being shed, is Mazda looking to adjust its dealer numbers or pick up new points? There are various reasons for dealers closing their doors. Aside from the economic situation, there is also the credit crunch. And that acts like a web or net. Those who can make it through the net are successful, but those who got caught weren't very viable in the first place. I believe that those dealers that remain today are the viable, robust businesses. Unfortunately, Mazda also suffered from having some dealers who were unbackable and withdrew. And for those open points, we received offers from dealers of other franchises to pick up our brand. So we want to carefully look at each proposal as we make new appointments. Are you looking to increase the number of dealers? Just to the extent that we can fill open points. But there is no intention to increase the whole competitiveness. Reasonably so. But it is a desire that they improve their profitability so we are considering various measures. As you well know, in the automotive industry, without profitable dealers, the whole structure isn't viable. It's completely pointless if only the automaker makes a profit.